1. Stop the EDL from marching in Walthamstow. Over the last two years, the English Defence League (EDL) have held countless demonstrations across the country, where they have rampaged through towns, attacking mosques, businesses and individuals. More recently, they have begun to attack peaceful demonstrations and multicultural and trade union meetings. The EDL have decided to have another London based march, this time in Walthamstow. Each time the EDL assemble, minorities and trades unionists are subjected to threats and racial/religious abuse. They rely on threats and intimidation, but they can be stopped. Last year, the EDL were prevented from marching through Tower Hamlets due to a fantastic show of unity from the local community. It is essential that we show the same level of unity to stop them in Walthamstow. Camden UAF are pleased to show solidarity with the residents of Walthamstow by supporting this event. We will be meeting to go to Walthamstow as a group at King’s Cross station and taking the underground. Meet 10am outside the old concourse. Please join us. Celebrate Walthamstow’s fantastic, multicultural community. Show the EDL that we will not tolerate their politics of hate on our streets. This event is going to be huge, anyone that’s been involved in fighting racism over the last 10 years needs to be here! Pandit G + Many More. and LMHR posters and memorabilia. Earlier in the evening we will be hosting a night of poetry and comedy. 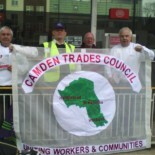 This entry was posted on August 20, 2012 by CAMDEN TRADES COUNCIL.